Once you have created an account and purchased the services you want, navigate in your internet browser to the TheraPolicy Manager. 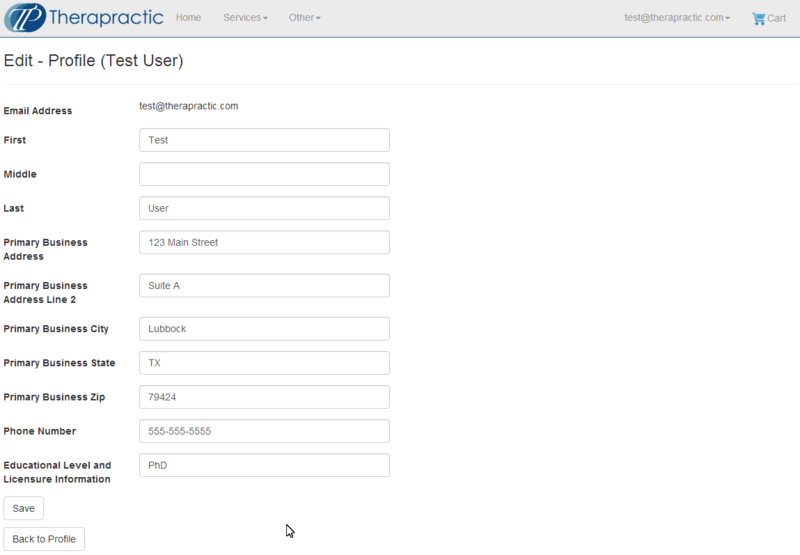 Log in with the email and password that you registered with at sign up. You will then be directed to the TheraPolicy Manager’s main page. Before you begin working on your manual, we recommend you verify and complete your profile information, as this will become part of your final manual. You can access these by going to the Home link at the top of the page. There are two relevant areas, Manage Profile and Organizational Management. Some of the information will be populated from what you entered at registration, but you will need to edit and fill in the other areas. 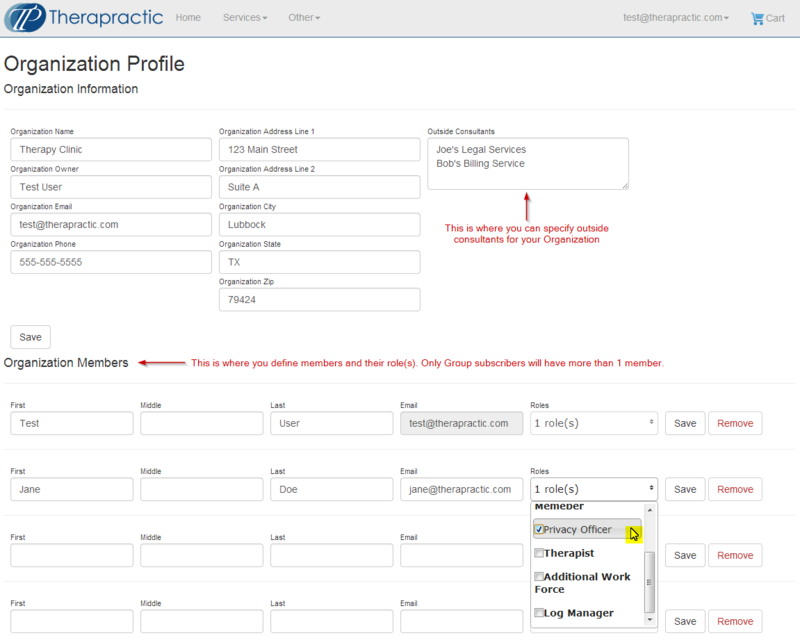 Under Manage Profile are items such as email address, physical address, phone number, etc. The email listed is the one associated with your log-in credentials. To make changes, click the “Edit Profile” Button. In addition, you can change your password by clicking the “Change Password” button. Under Organizational Management, you will find more detailed information about your organization, including members and their roles. If you have an Individual account, you will only have one member. If you have a Group account, you will be allowed to have multiple “Organization Members”. This is where you should specify the people who have unique roles in your organization, such as HIPAA Team Members, Privacy Officer, Security Officer, Therapists, Log Manager, etc. Only the Administrators have full access to all features. To continue to the creation and customization of your TheraPolicy manual, navigate to the top of the page, click “Services”, and then select TheraPolicy Manager. 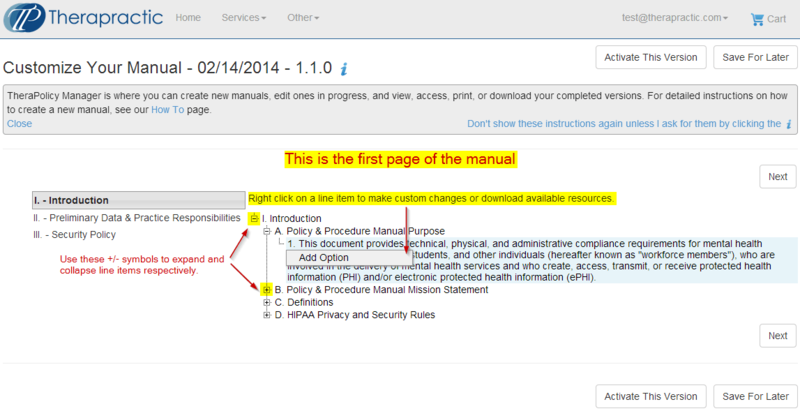 To begin, click the “Create New Manual” button in the upper right corner of your screen. This will create a new version of the manual for you to begin customizing. It will be named “Edit – [Date of creation] – [Version number]” to indicate that it is “In-Progress”. It will be saved in the section called “Manuals In-Progress”. Click on the link for the version you wish to edit, and you will be directed to a new screen. You will now see the heading “Customize Your Manual – [Date of creation] – [Version Number]”. The table of contents section is on the left and allows you to go to different areas of the TheraPolicy. On the right is the actual body where you can begin reading the law (which is NOT editable) and sections where you can begin to customize options based on your practice. As you begin to customize your manual, you will see that entire sections are expandable and collapsible using the “+” and “-” symbols to the left of each line item. There are portions of TheraPolicy which are uneditable due to the fact that they are either quoted directly from the Law or detailed explanations and elaborations of the Law. As the end user, you have the ability to customize the options, which are basically the procedures for your practice to fit the policies outlined by the Law. All editable options will be indicated by a pencil icon at the end of the line item. When you begin, all options will be selected and indicated by a green check box at the start of each item. All changes you make will be automatically saved. If you choose to leave the process and come back later, just click the “Save For Later” button at the bottom of the page to resume at a later time. Checked items will be present in the final version. Therefore if you choose to use options we have predefined, just leave them selected. If you wish to alter a predefined option, you will need to edit the option. Do so by right-clicking the line item and selecting “Edit”. You can then reword the options to your liking. Hit “Enter” on your keyboard or click elsewhere on the page with your mouse and the changes will be saved automatically. If you do not wish to have a predefined option present, make sure it is unchecked. You will then see a strikethrough line, indicating that it will not appear in your final version. It will still remain saved if you ever choose to use it in the future. IMPORTANT NOTE: If you right click and select “Delete”, the option will be permanently deleted. So if you think you may wish to use an option in the future, just uncheck it. Right-click on the area under which you want to define a unique option (e.g., Risk Analysis) and select “Add option”. You will see a text box appear at the very end of the list of predefined options. Place your cursor in this box and type what you wish to appear in your manual. When completed, either hit “Enter” on your keyboard or click elsewhere on the page with your mouse, and the option will automatically be saved and selected. As with predefined options, unselecting the option will exclude it from the final version but will allow it to be re-selectable later, whereas deleting it permanently removes the option. To proceed to the next section you can navigate using the Table of Contents on the left side of the screen and by utilizing the “+” and “-” symbols to reach the subsection of your choosing. 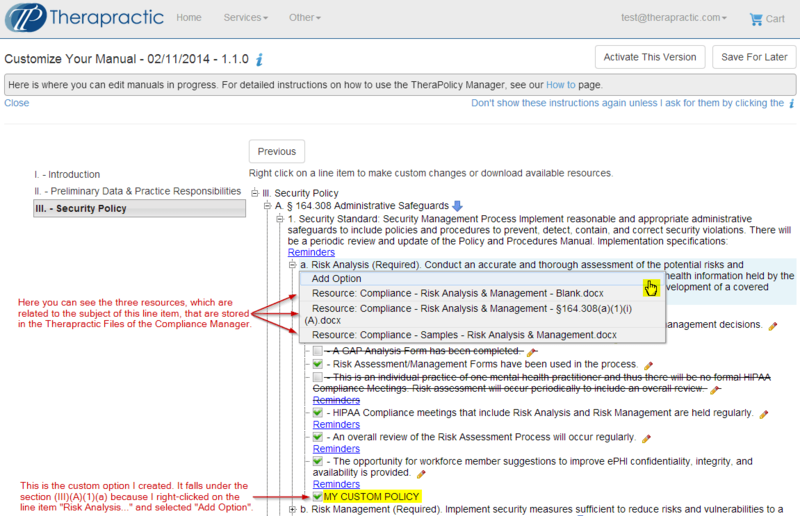 As you are going through, you will see Blue Arrows indicating we have selected resources from our Compliance Manager which we think would be helpful for this specific line item. 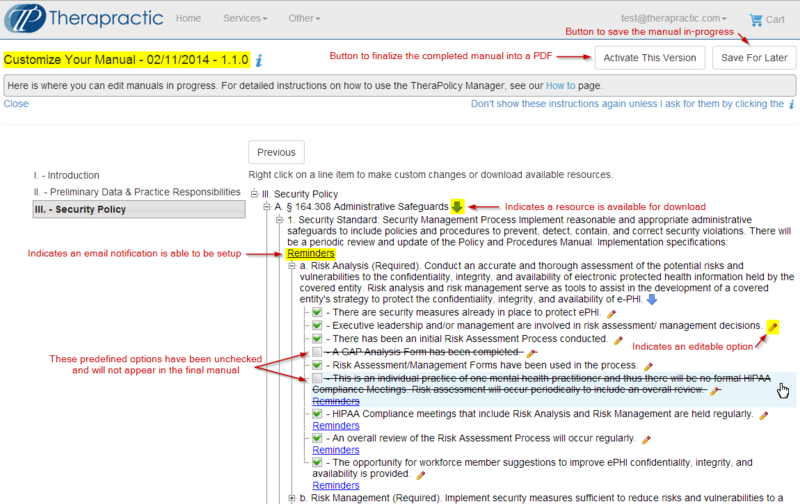 These include files such as direct quotes from the Law, Risk Analysis & Management Templates, Agreements, Logs, etc. To see the resources we have linked, right-click on the line item and you will see a dialogue box with the resource(s) listed. To access the file, simply click the resource you wish to see. Depending on your browser settings, the file will automatically download, open, or prompt you to save or open the file. If the resource is a template you wish to begin altering, we suggest you save it on your local computer, make any changes you see fit, and save it. In addition, we highly recommend you use the “My Files” section of the Compliance Manager to backup your files on the cloud. See the How To for further instructions about uploading files. These resources and icons will NOT appear in the final version of your TheraPolicy. In addition to resources, you will occasionally see options for “Reminders”. This is a feature that allows you to have our system send email notifications reminding you of compliance based events (e.g., HIPAA Team Meetings) at the frequency of you choosing.